It has been a few years since Adam and I visited Prague, but we talk about that trip all the time. We reminisce about walking around early in the morning before the tourists swarmed the city’s main attractions, feeling a little better about succumbing to jetlag and falling asleep early the night before. We talk about the food, the beer, and the beautiful weather. Mostly, though, we talk about the sightseeing. 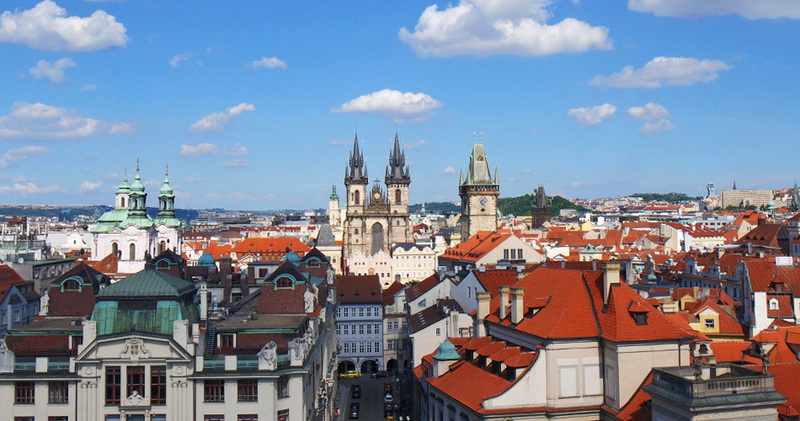 It says something when a city stays with you long after you leave, and that’s true about Prague. I just have to close my eyes to see the colors of the Astronomical Clock and hear the laughter of fellow travelers enjoying a day in the city. 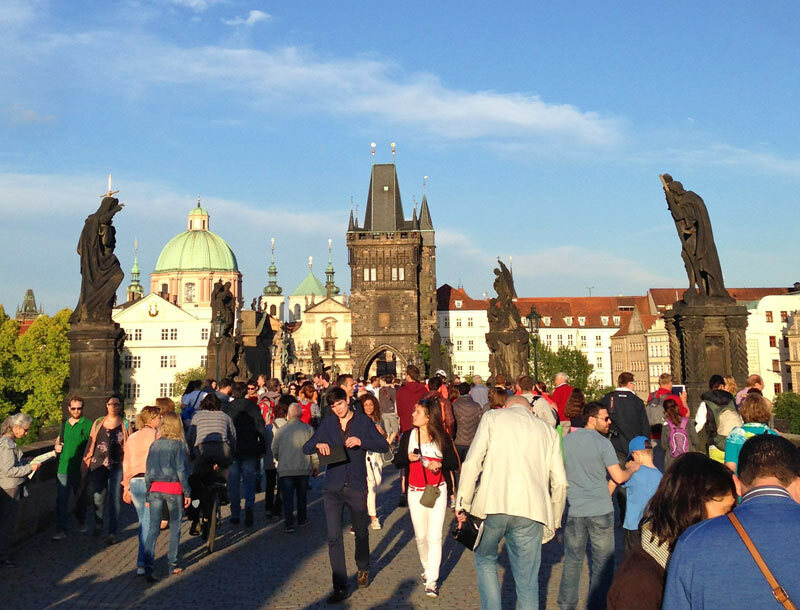 Vacations should be memorable and full of experiences you enjoy reliving, and that’s why we’re excited to share the highlights from the days we spent in Prague. 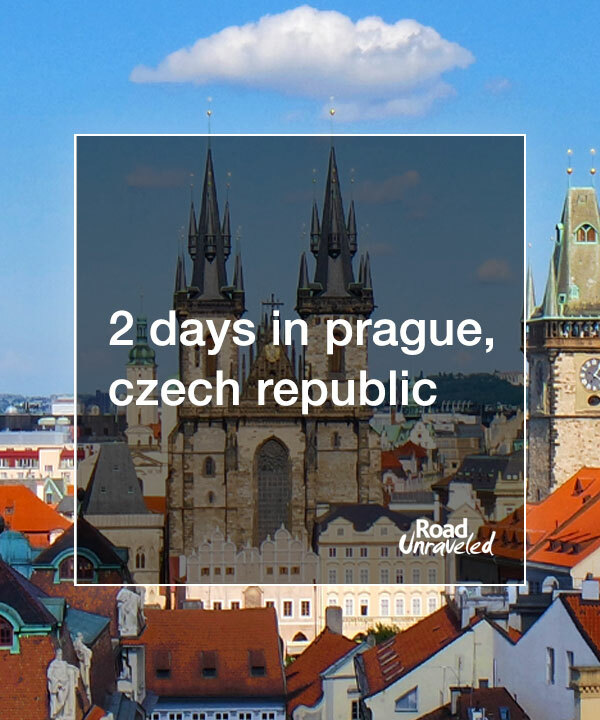 Whether you have just two days like us or a whole week to explore the city, there is a lot to love about the Czech Republic’s capital city. 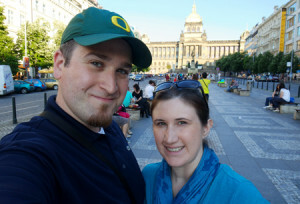 Here are 12 of the highlights we loved the most during our vacation in Prague. 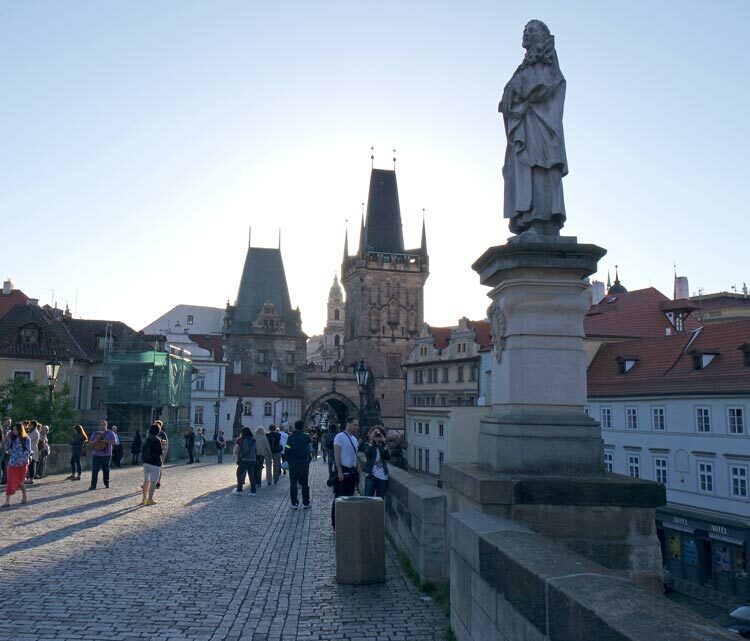 There’s a good chance the Charles Bridge will be one of your favorite stops in Prague. 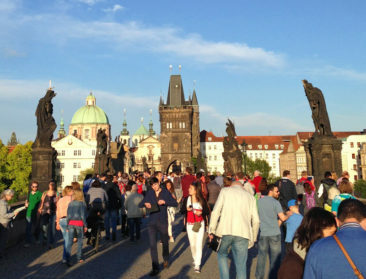 One look at the sea of people crossing it will tell you you’re in good company; it’s one of the can’t-miss stops on any Prague itinerary. The bridge was constructed in 1390; it was commissioned by Charles IV, although the bridge didn’t take his name until the 19th century. The bridge is reserved for pedestrians these days, and it’s notable for the statues that line it. Perhaps the most notable statue is the tribute to St. John of Nepomuk, who was martyred when he refused to betray the Queen of Bohemia’s confession to King Wenceslas. At the base of the statue are two plaques: one featuring the Queen with a dog, and a second that depicts St. John before he was thrown off the Charles Bridge. 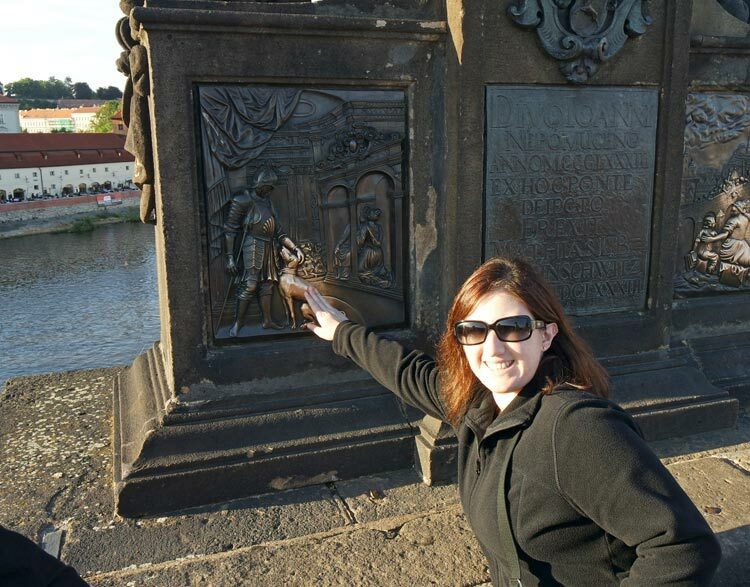 Legend has it that visitors who rub their hand on the St. John plaque will have a wish granted and will return to Prague. Although many people also rub the Queen’s image (including me! ), the legend is hazy on what will happen: some say you will get good luck, some say bad luck, and some say nothing will happen at all. Years later I can say life has been very good to me, so I’m a believer that only good luck will come to those who visit the Charles Bridge. 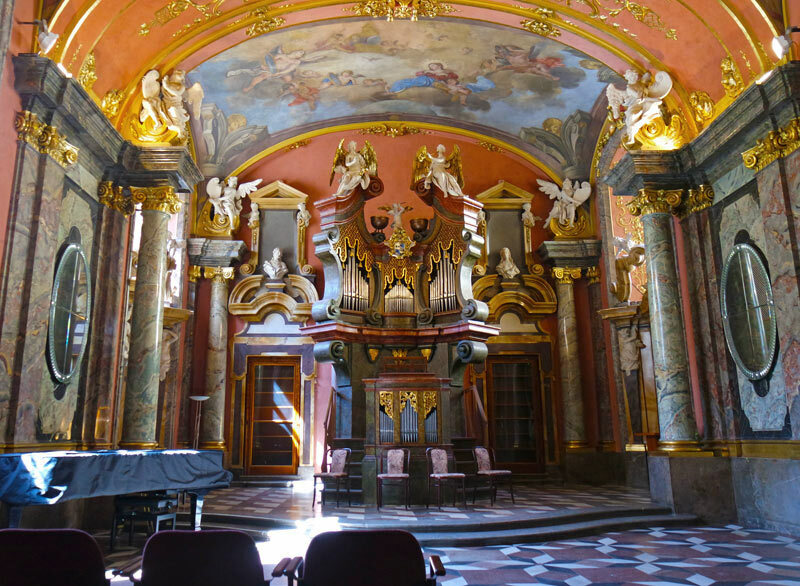 The Klementinum (sometimes spelled Clementinum) quickly became one of my favorite spots in Prague, and it is certainly among the most memorable. Dating back as far as the 11th century, it was during the mid-1500s that the Jesuits developed the area into a college. 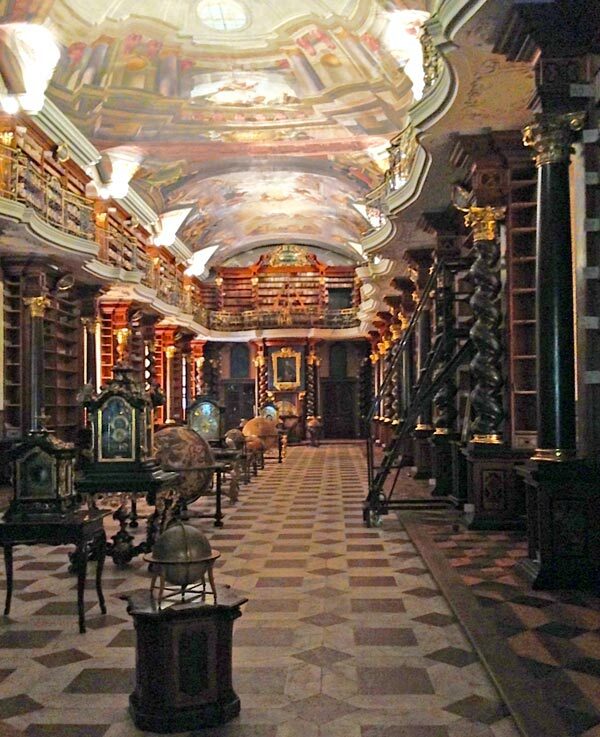 Later, it was established as an observatory and a collection of libraries. 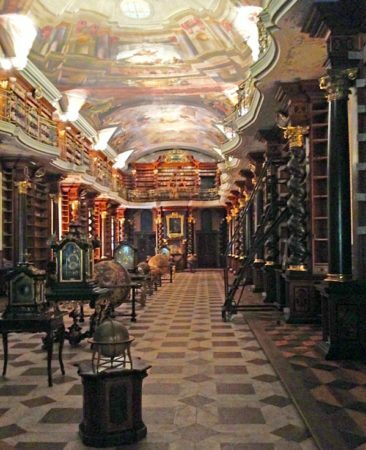 Today the Czech National Library calls the Klementinum home. The hour-long guided tour is wonderful, and it provides a great historical overview as well as an inside look at some of the rooms. We especially liked the Chapel of Mirrors, where concerts are often held in a space deepened by dozens of mirrors that reflect throughout the room. 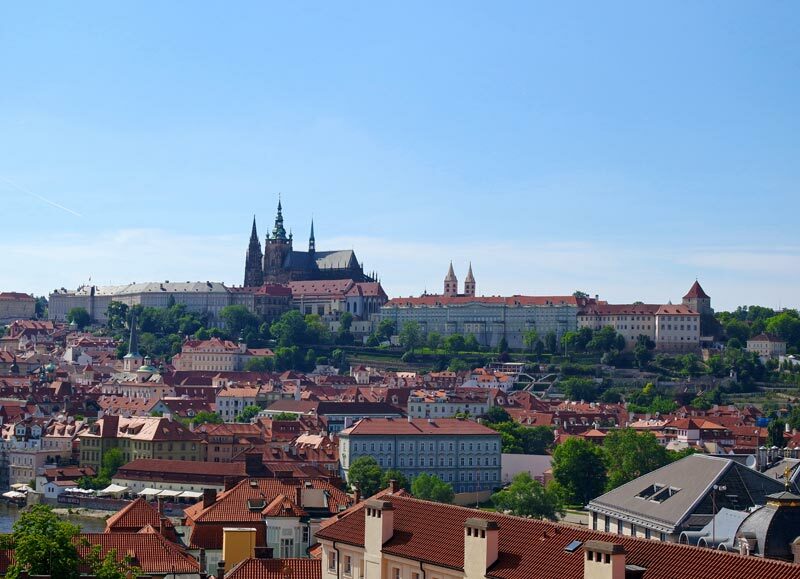 If you’re looking for a great panorama shot of Prague’s skyline, don’t miss the Klementinum’s Astronomical Tower. The view from the top of the Klementinum can be seen in the photo at the top of this page. The Klementinum’s Astronomical Tower was used as an observatory until about 100 years ago, and we thought it provided the best views of the city. As you walk through Prague, there’s a good chance a surprising—maybe even offensive—statue will catch your eye. David Cerny’s public sculptures dot the cityscape, and many of them walk the line between amusing and distasteful. 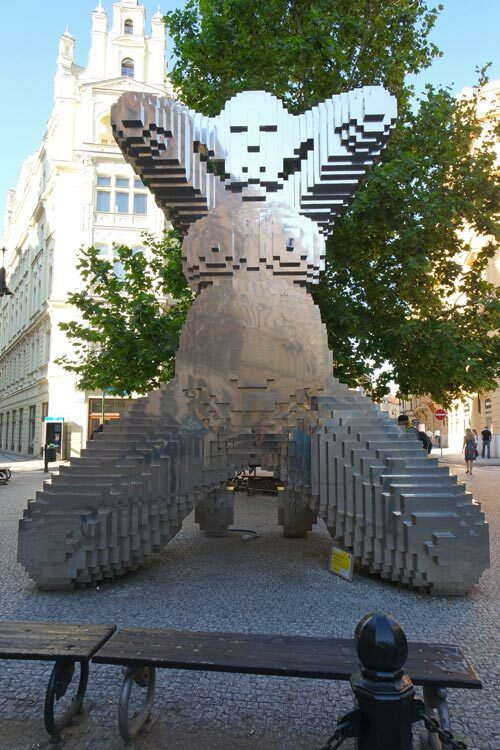 Cerny is controversial, but he is also the Czech Republic’s most famous sculptor. One of his more famous works is “Tower Babies,” where huge, alien-like infants are poised in crawling positions. “UnUtero,” a soaring metallic pregnant woman, caught our eye. Jaroslav Róna’s Kafka statue is worth seeking out as well. 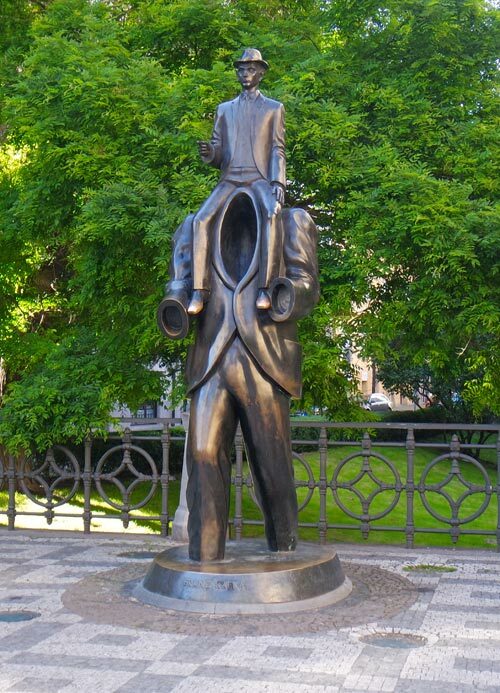 It shows Kafka riding on the shoulders of a headless man, a scene out of his short story “Description of a Struggle.” Art is everywhere in Prague, and we loved how it surprised and challenged us. A visit to Prague isn’t complete without a walk through its famous castle complex, and you can easily spend a few hours or a full day exploring some of the highlights. The Prague Castle is a UNESCO World Heritage site, and it boasts more than 1,000 years of history while simultaneously holding the distinction of being the largest ancient castle in the world. 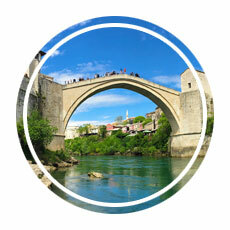 It’s very first building was erected in 870! The castle is fascinating because, largely due to its age, it represents almost every major architectural style. 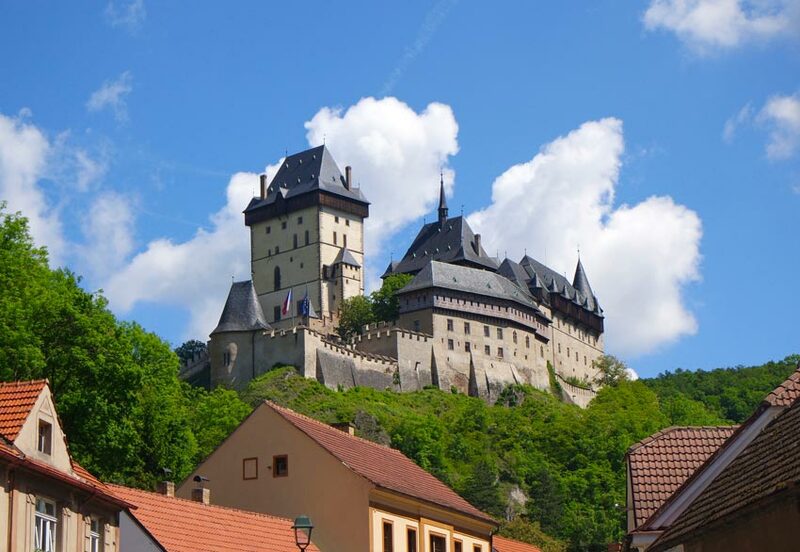 During the centuries the castle sustained damages from wars and fires, and it was rebuilt and extended until it reached the size and scale it represents today. Comprised of churches, palaces, and towers, it’s a remarkable sight to see and a great stop to make on your tour of Prague. Extending into the skyline, St. Vitus Cathedral is one of the most recognizable landmarks in Prague. It is a Roman Catholic church that still holds regular services, and you will find it within the Prague Castle complex. The cathedral’s construction began even before the Charles Bridge (in fact, progress was delayed when work on the Charles Bridge began). St. Wenceslas Chapel is widely regarded as the cathedral’s main highlight. Although the public cannot directly enter the room, it is possible to look in and see the massive murals and Gothic statue of St. Wenceslas above the alter. From the outside, St. Vitus Cathedral is a defining structure and often confused for the castle itself. Whether you walk through the interior or simply admire it from afar, it’s an impressive piece of history and architecture. The Golden Lane. Prepare to squeeze through a crowd of tourists! 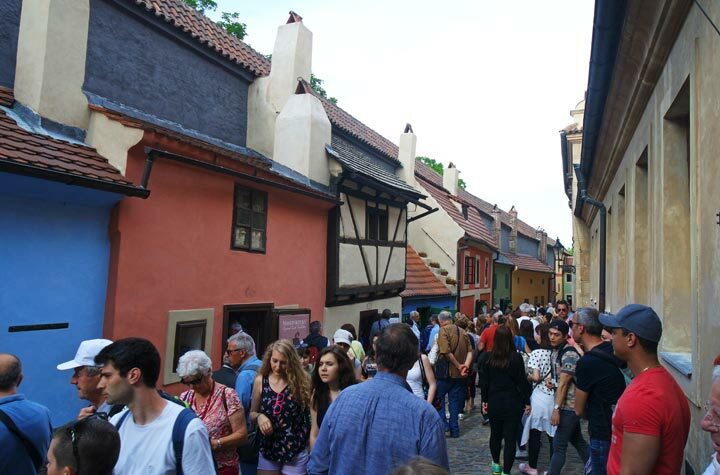 Within the Prague Castle complex winds Golden Lane, a historic 16th century street famed because author Franz Kafka lived and wrote in House #22 in 1916 and 1917. The street is lined with bright, colorful homes that are mostly converted into small museums or souvenir shops. Because it is part of Prague Castle visitors are required to pay to see it during the day, but when the castle closes to tourists in the evening it is possible to visit for free. Understandably, evenings on Golden Lane are busy and sometimes force tourists to walk shoulder to shoulder with others looking for great pictures or interesting items to buy. Still, it’s a great place to check out. If you are hoping to combine history with shopping, Wenceslas Square in the new town (Nové Město) is a good place to include on your Prague itinerary. The most important point of interest is the statue of St. Wenceslas on horseback, flanked by Bohemia’s patron saints Prokop, Adalbert, Agnes and Ludmila. You’ll also find the National Museum and a memorial to Jan Palach and Jan Zajíc, who are remembered for immolating themselves in protest of the Czech Republic’s response to its communist takeover. Today communism is certainly a thing of the past; Wenceslas Square is one of the main shopping districts in Prague, and it is a popular tourist spot for that reason. 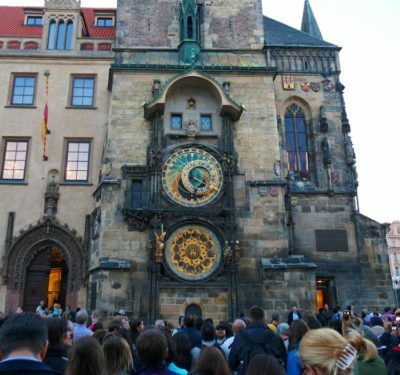 No trip to Prague is complete without seeing the Astronomical Clock, which is one of the most recognized tourist attractions in the city. It is a true medieval astronomical clock on the side of the Old Town Hall that dates back to the early 1400s. Today it is most notable for the hourly “Walk of the Apostles” show, where carved apostles and other figures (including a skeleton representing death) dance about as the clock strikes the top of the hour. The clock also features an astronomical dial and a calendar dial. 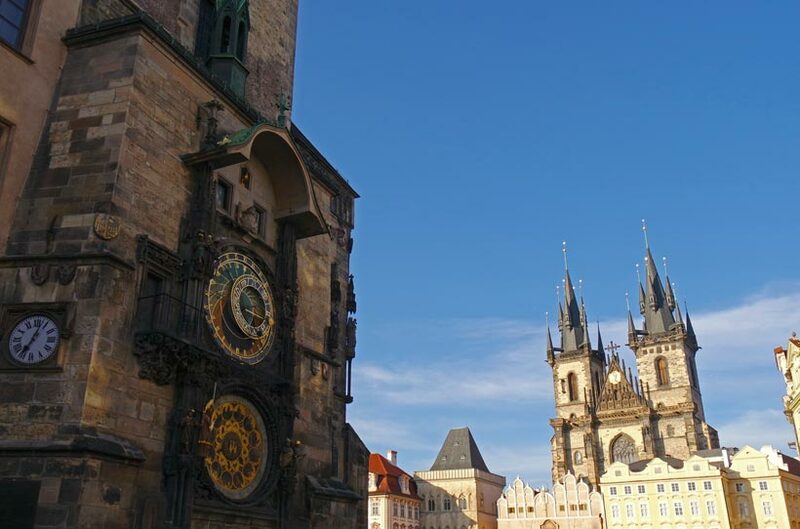 Legend states that the city will suffer if the clock ever falls into disrepair, so it comes as no surprise that the clock is meticulously maintained and remains a highlight for any visit to Prague. Because the “Walk of the Apostles” begins at the top of each hour from 9:00 AM – 10:00 PM, it’s a good idea to arrive early to secure a front row spot for the show. One of the most beautiful town squares in the world greets tourists in Prague, where the old town (Staré Město) is still the center of the action. The square first came into existence in the 12th century as a market, and that is what you will find almost 1,000 years later. 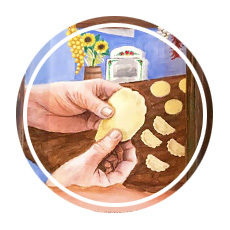 In addition to historic structures and winding roads, dozens of vendors and restaurants serve meals and local beer. Grabbing a seat outside provides the perfect spot for people watching and simply soaking in the atmosphere, which felt joyful and carefree every time we walked through. 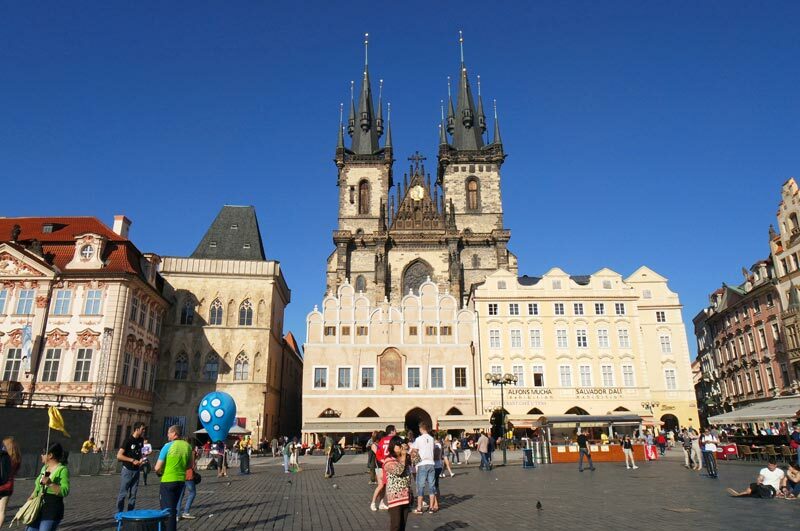 The Old Town Hall, Týn Church (with its unmistakable spires), and the Powder Gate are just a few of the attractions you won’t want to miss when visiting the Old Town Square. In a city full of ancient architecture, one of its newest constructions will likely stay in your memory long after you return home. 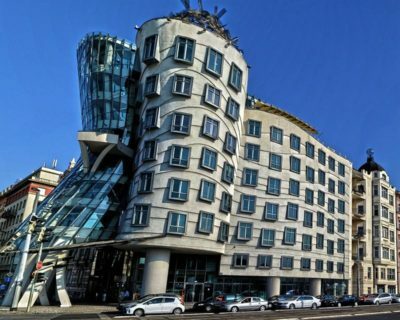 The Dancing House was built from 1992-1996, and it combines 99 uniquely shaped panels to create a structure that resembles two people dancing. It is used as an office building, although it also has a restaurant (appropriately named Ginger and Fred after famed dancers Fred Astaire and Ginger Rogers). 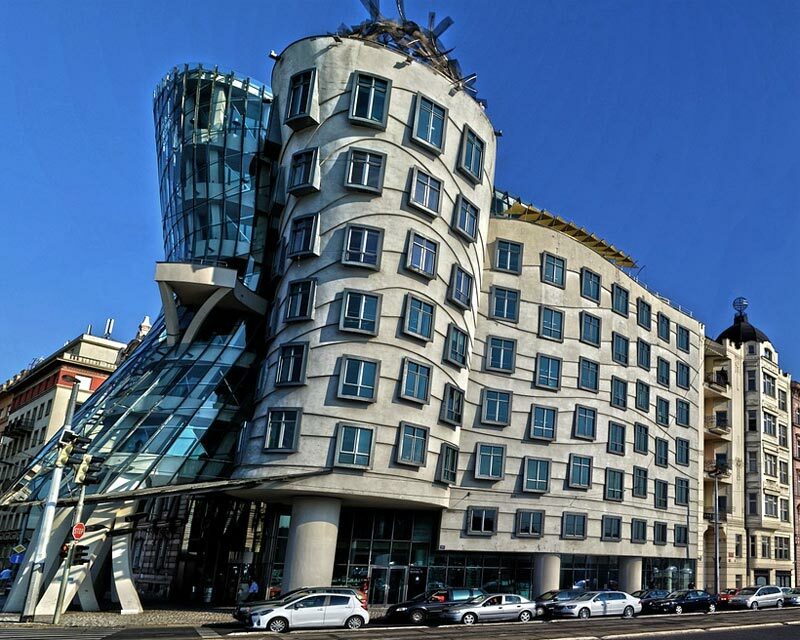 The Dancing House is certainly worthwhile to stop by for a few photos and to admire the nontraditional design made even more surprising against a backdrop of some of the oldest buildings in the world. We stayed at the Exe City Park Hotel during our two days in Prague and we were very happy with the experience. The location was perfect for us; it was close to the train station yet still an easy walk to Old Town Square, the Astronomical Clock, and plenty of restaurants. Just about one hour southwest from Prague, Karlštejn Castle is a fascinating day trip that provides a walk through one of the Czech Republic’s most famous castles. Founded in 1348 by Holy Roman Emperor-Elect and King of Bohemia Charles IV, the castle sits high on a hill and was used to protect national treasures including the Bohemian/Czech crown jewels. 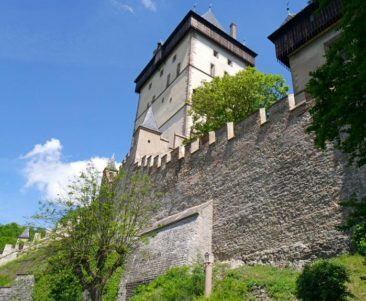 Today the castle itself is sparsely decorated, as it was looted during the communist regime, but it’s a terrific spot to visit to get a different perspective on Czech history. 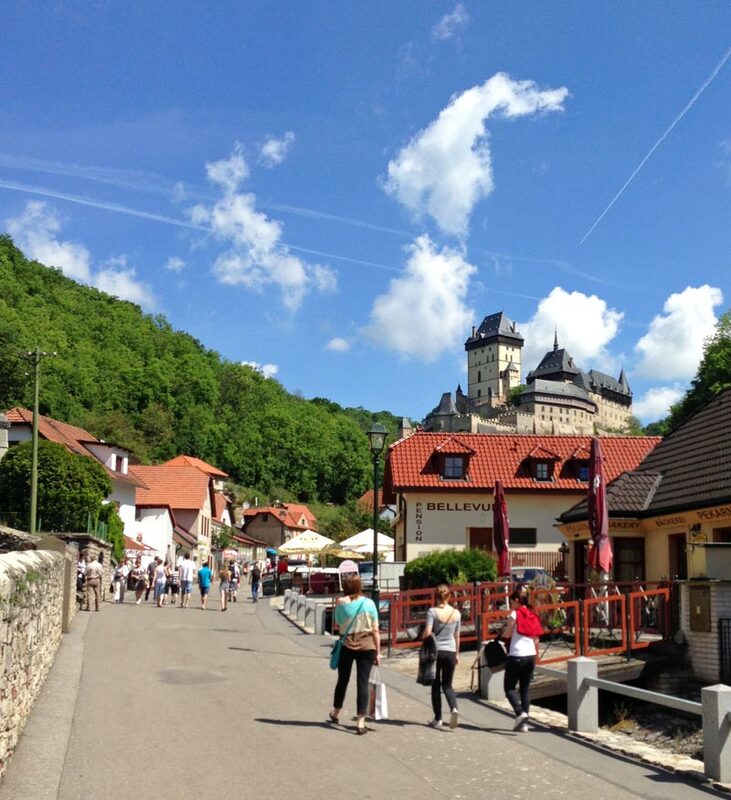 Be prepared for a bit of a hike up a steep hill to reach the castle, but you’ll be rewarded with lots of cute shops and cafes to take a break on the way up or after your visit. If visiting suburban Prague is of interest to you, another great town is Kutna Hora. It is a UNESCO World Heritage site with plenty of restaurants, churches, and historic buildings to enjoy, but the main attraction is the Sedlec Ossuary, or the Bone Church. 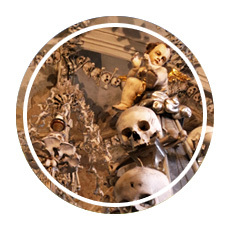 If you are planning to visit Kutna Hora, our overview of the Bone Church will give you some great history and thoughts about what your experience might be like! 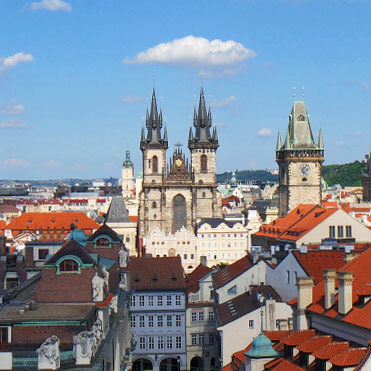 Prague is one of our favorite European cities. There’s a good reason it has become a popular vacation destination: it’s easy to spend a day or two or a week or two exploring and enjoying everything the city has to offer. Don’t be surprised if, like us, you can close your eyes and instantly be transported back to Prague years after your visit. 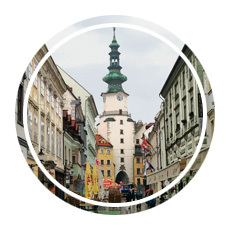 The history, architecture, and sightseeing may inspire you to see even more of Eastern Europe—or the world beyond! 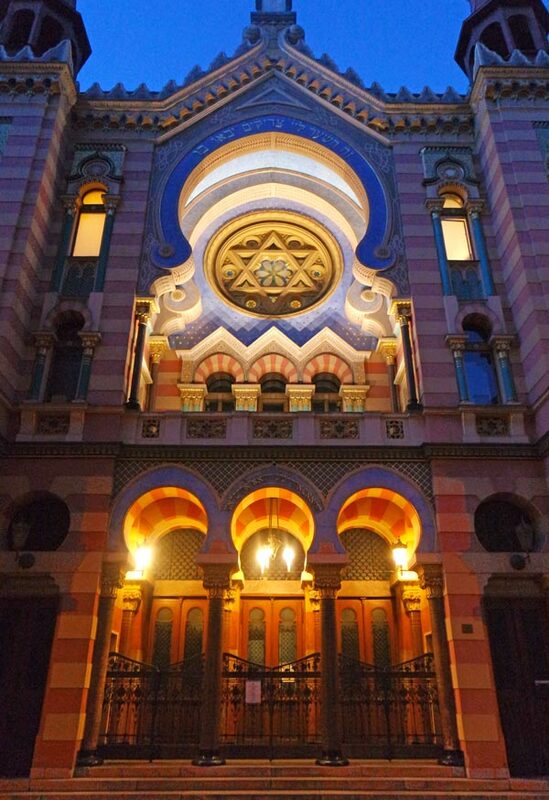 We already know we want to return to Prague one day. There is so much left to explore, and we look forward to seeing our favorite spots one more time. Even though there are plenty of new places to explore, there is a certain charm to revisiting a favorite place, and Prague is certainly on our list of favorite cities around the world.